Jimmy was a Yorta Yorta man from Cummerangunja Mission in New South Wales. He was a celebrated and beloved Australian Aboriginal entertainer, actor and advocate whose career spanned six decades. 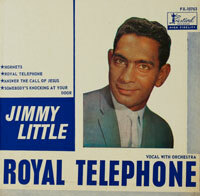 Jimmy recorded his first single in 1956 and rose to prominence throughout the 1960s, some years before the 1967 referendum. He topped the charts and became a household name with ‘Royal Telephone‘ in 1963, which sold over 75,000 copies and went double gold. 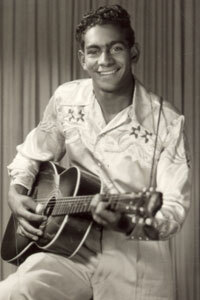 His nation-wide profile continued to grow through regular TV appearances, radio airplay and constant touring. Jimmy also began acting in the late 50s with a major role in Shadow of the Boomerang followed by performances in stage plays including Black Cockatoos and a film, by Tracy Moffatt and Wim Wenders, ‘Until the End of the World‘. In the 70s, Jimmy was hailed as one of Australia’s founding and premier country music stars but he also remained fond of orchestral and other genres of music, exploring other musical directions in a number of recordings and performances. In the 80s, Jimmy began working with young people at the Eora Centre in Redfern, becoming known as a role model and mentor for Indigenous youth, and from 2000 was a Guest Lecturer at the University of Sydney’s Koori Centre. In 1999, Jimmy received an ARIA award for Adult Contemporary album with ‘Messenger‘, which reached the top 10 of the alternative music charts, introducing Jimmy to a new, younger audience. That same year, Jimmy was inducted into the ARIA Australian Music Hall of Fame. Throughout his illustrious career Jimmy received every major Australian music industry award, plus several honorary doctorates. 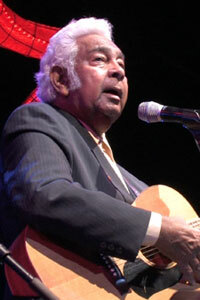 Jimmy was the recipient of the National Aboriginal Day of Observance Committee’s ‘Aboriginal of the Year’ award in 1989, was named NSW Senior Australian of the Year in 2002, and received the Australia Council’s Red Ochre Award in 2004. He was awarded an AO (Order of Australia) for his continued work with Indigenous Health and Education programs, and in 2004, a public vote named him ‘a living Australian treasure‘. Jimmy was the patron of The Indigenous Doctors Association of Australia, an ambassador for The Fred Hollows Foundation and Kidney Health Australia. Dr Little was also an ambassador for literacy and numeracy with the Federal Department of Education Science and Training. Jimmy founded Uncle Jimmy Thumbs Up! 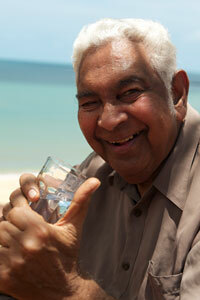 in 2007 to improve health and nutrition across Indigenous communities in regional and remote Australia. Thumbs Up!’s activities have grown to include the provision of nutrition and healthy lifestyle education, alcohol and other drugs and family violence awareness messaging and Trachoma awareness delivery in the APY lands of South Australia. 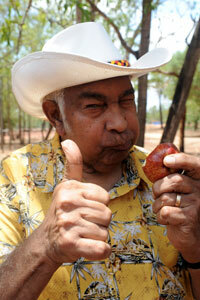 Please visit the sponsorship or donations page to see how you can help the Uncle Jimmy Thumbs Up! make life better for the first Australians.